This was the statement of Migrante International chairperson Garry Martinez on the fourth day of the Papal Visit in the Philippines. “We cannot recall a time when the President has been anything but defensive, arrogant and unrepentant. Instead of taking accountability for his government’s corruption and anti-poor policies, he is always ready to either blame others or point the finger at his critics. His shameful speech in Malacanang attests to the fact that he has no mercy and compassion for poor Filipinos. 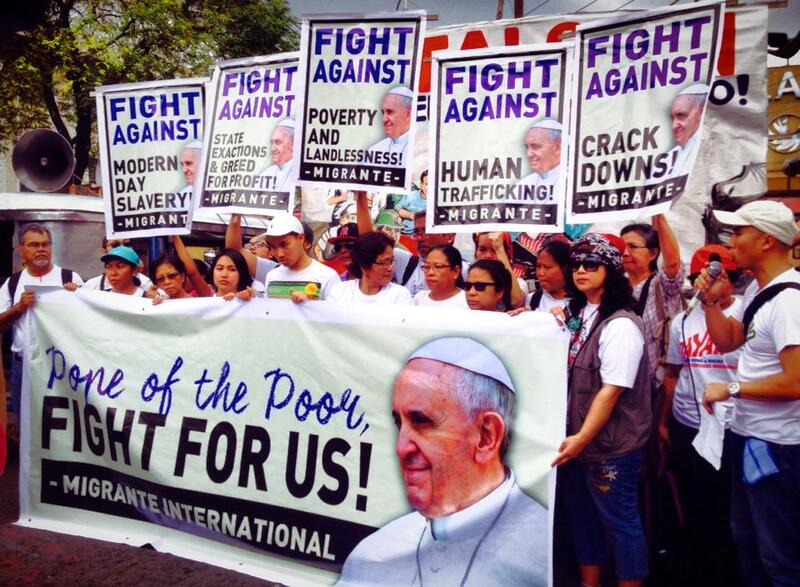 We sincerely pray that the Pope’s visit presents this contrast, and urges the Filipino people to continue to work for genuine change and social justice,” Martinez said. He said that Filipino communities and overseas Filipino workers abroad will be staging “Thank you, Pope Francis” activities as the Holy Father is set to celebrate his final mass in Luneta. This entry was posted in News and tagged corruption, Migrante International, migration, noynoy aquino, OFW, Papal Visit PH, Pope Francis. Bookmark the permalink.